It was started as a practice box for learning some of the carving techniques I picked up from Peter Follansbee's great video "17th Century Carving Techniques" and eventually it turned itself into a real project that has found a real home. If I pick it apart there are things I'll try and improve on next time. I do believe from a purely aesthetic perspective that the lid dimensions can make the box look top heavy from the right perspectives. Of course I can see every missed strike of the carving chisel when I look at it but I understand the reality is that most others could not unless they went in looking for specifically for evidence of mishaps. The sliding till's dovetails were a bit sloppy and the dovetails and the brass now looks very out of place, but again, I was kind of shooting for non-traditional at the moment and that gives me ground to defend those decisions too. My biggest dislike is the oak stock I chose. It's an edge glued up red oak box store board and if you look it's very evident. Again I bought the board as a practice go, I never expected it to turn out as well as it did, and that makes some of these detail mistakes more evident to my eyes. The things I like about my work is that the dovetails on the case are nearly perfect in execution. I like tho contrast of the walnut and the red oak, before the danish oil finish was applied they looked too contrasting, but the finish helped even the playing field, and as time goes on and the oak darkens with age, I think the contrast will mellow to simple accent. I like that I pulled it off! I like the flow of the carvings, the modifications to the patterns I made including the medallion riff on the sides and where I took the pattern on the lid. I can see now where I might have increased the detail, but there are times when less is more. 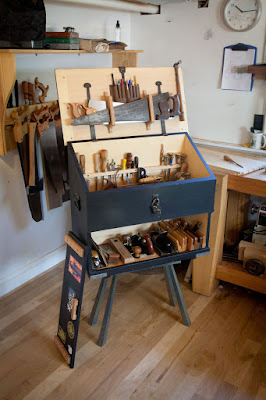 All in all I have to say this is not a bad foundation to build upon, it grew my carving skill immensely and I even used it to practice some lessons that helped later when I built my version of a traditional tool chest. 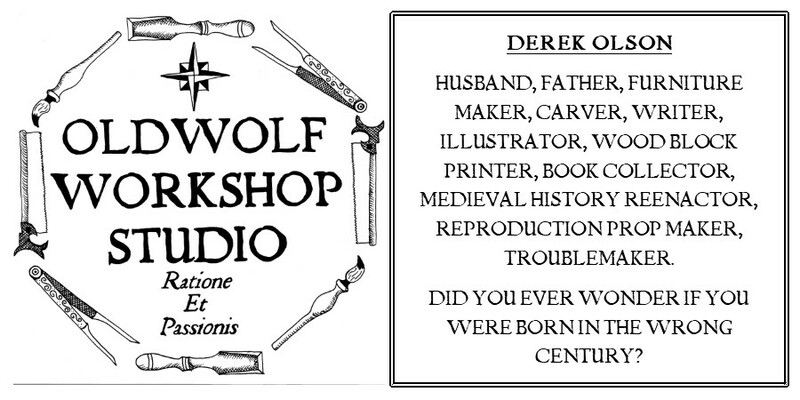 Really excellent, Oldwolf. I am very impressed with your work. I think Peter would be proud of having passed along his insights to make this piece happen. I have been enjoying following your blog the last month or so and look forward to new posts. Be well, measure twice, and cut once. I think it turned out very well. The contrasting woods add a nice touch to the overall appearance as well. As to the red oak, well, we works with what we gots. I think you beat it into submission nicely. Excellent post and nice box - thanks for taking the time to record your progress. I am thinking about trying my hand at carving and you have inspired me to go for it. I like the box. The trim really sets it off. David, I am happy to hear I inspired you to give it a go. I love to hear those words. Good luck and if I can be any help feel free to drop me a line. A beautiful carved box - congratulations! And I like the contrast in timbers which is nicely echoed in the end grain of the dovetails. Wow, this is truly spectacular. The level of details is astounding. Great job! Beautiful! I know what you mean about seeing every mistake when you look at it... but as a woodworker myself, as well as holding a design degree (ie; systematically taught to be picky and elitist ;0) I can't see a thing that I'd change. Nice work. Thank you for the compliment, with your background that really is something. I appreciate it. Signs, Signs, Everywhere Signs . . .